“Worship” means many things to many people. It refers to acts and attitudes, celebrations and rituals, events shared by groups and individual experiences. It refers to ascribing value or worth to ideals, ideas, beliefs; to giving homage and praise to a god or gods; to taking time and intention to centering oneself and focusing on values and ideals. Definitions of “worship” are at best culturally contextual – there is no one right or shared definition. The following is how we describe Unitarian Universalist Worship at People’s Church. The verb worship means to shape worth. The meanings of worth suggest the purpose of worshipping: to come to be equal to, or to turn toward, the highest or best values. To worship is to give useful, instructive shape to those often abstract values, to symbolize or articulate them in memorable and helpful ways. We create, and we cut back, the words and symbols we use in worship according to their usefulness. They are never fixed, but do endure as long as they serve the purpose of showing us the good we strive toward (or of binding a worshipping community together). In the early 1980s, the Unitarian Universalist Association (UUA) appointed a commission of ministers to write a resource booklet and guide to worship of UU congregations. The booklet produced by that commission in 1983 (Leading Congregations in Worship – A Guide) included the following broad description. Unitarian Universalism is a tradition coming from the radical wing of the Protestant Reformation, a decades-long struggle within western Christianity, to define sources of religious authority and forms of religious community. 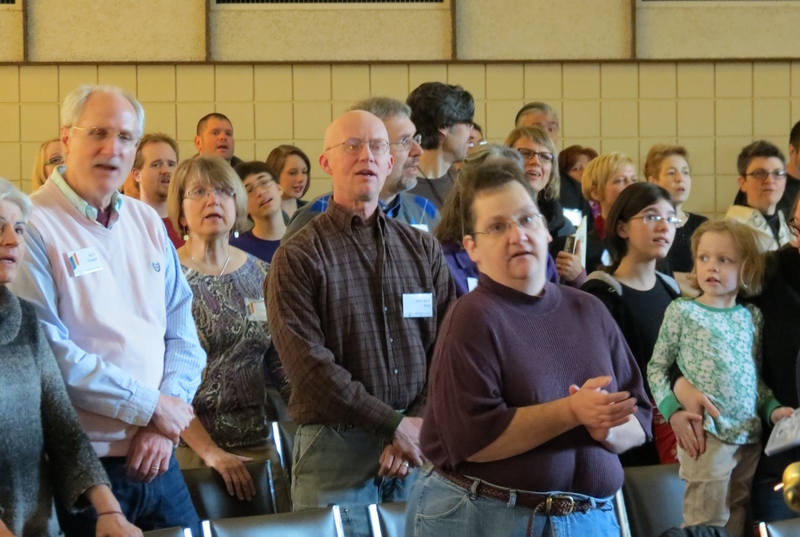 The most common Sunday Service in a UU congregation looks more like a protestant Christian worship service than any other kind of worship. Yet, in nearly 200 years of American Unitarian/Universalism, much has changed as the religious culture has become much more diverse. Therefore, our services include diverse elements and broad aims. The language of “service” (as in Sunday Service) is reminiscent of Catholic and other forms of worship which were based on liturgies, or scripted conversation, designed to teach doctrine and re-enact shared beliefs among a community of believers. When we refer to the Sunday Service, we are referring not to a specific liturgy, but to a program of readings, music, meditations, essays, silence, sharing, and more, the goal of which is to remind us of our highest ideals while acknowledging the realities of human life. Wisdom from the World’s Traditions – a reading from one of the sources of wisdom for our religious growth and learning, from any and all of the classical religious traditions, or from poetry, prose, science, etc. Sharing Service – a story for all ages, aimed primarily at elementary aged children, to help them learn about our tradition, to help them know and feel that they are a valued part of our inter-generational community, and to help them understand what it means to be a Unitarian Universalist. The children and youth leave for their classes following this time of sharing. Pebbles of Celebration and Sorrow – a time to share with each other the most important things that are happening in our lives – our experiences of loss and gain, of birth and death, of fear, of joy and gratitude of sickness, recovery and health. This kind of sharing is very important for us as a community, to know what is true and real for each other and therefore for ourselves – to affirm the realities which connect us. It is also a very big challenge: to tell our own truths to focus on the most important things. This is not a time for political opinions, announcements of events, stories about other people, or long-winded details. The Offering – the sharing of our resources towards living out the missions and goals of the church. If you are visiting you are not expected to contribute – but if you choose to support our shared work, we welcome your contribution.